These ads are listed in alphabetical order first and then chronological with the earliest ads first. Black and white 5" x 13" ad for their Grecian Formula 16 Hair Color. The ad claims that you will "Look Younger...Feel Younger" and that you can say "Goodbye Gray Hair without coal tar, dyes or color rinse". The ad shows Before and After pictures with a man and a woman so that you can judge for yourself just how well it works. The text gives directions for use and claims for the results. This ad is taller than my scanner bed so the outer edges of the ad will not be visible in the scanned view. Black and white 7 1/4" x 10 1/2" ad for their Home Hair Trimmer. The ad has several pictures of this unique tool being used to trim the hair of men, women, boys, girls and legs. The price of only $1.00 is mentioned and claims that this is "How you can beat the high cost of haircuts". Black and white 9 1/2" x 13" ad for this Revolutionary new hair dressing for men. The ad has a large photo of a man's hat that looks like it has been sitting in water. There is a band of grease stains around the bottom of the hat with a black arrow pointing out an area of intense concern. The headline under this says "Wives: Make him a gift of this amazing new hair preparation that ends this problem". The major headline says that this "Revolutionary new hair dressing won't grease-stain your hat!". It is claimed that it "Keeps hair naturally neat all day - avoids that "slicked-down" look and leaves no oily stain!" The ad claims that there are two special ingredients in this stuff but it doesn't bother telling what they are. Black and white 7 3/4" x 10 3/4" ad for their Pin Curl Permanent. The ad has three pictures of three different ladies whose hair has been made-up with this product. The ad headline says "New improved Bobbi waves in style-support with the ease and softness of a setting" and later calls it "The easiest permanent to give yourself...". The ad also shows the 3 different kinds of curlers that come with this product and the quantity of each. Full color 10" x 13" ad for their three different Shampoos. There is a picture of a lady with very unusual eyes and a kindof frightening look on her face staring straight into the camera. The picture is labeled "Beautiful Hair" and the text begins by saying that "There are three Breck shampoos for three different hair conditions". There is a smaller picture that shows the bottles of shampoo for Oily Hair, Dry Hair and for Normal Hair. This ad is larger than my scanner bed so the outer edges of the ad will not be visible in the scanned view. Full color 8" x 11" ad for their Three Breck Shampoos. There is a picture of a regal-looking lady with red-hair gazing off into the distance over the caption "Beautiful Hair". The text explains that there are three shampoos, one for dry hair, one for oily hair and the third for normal hair. Full color 9 1/2" x 13" ad for the three different kinds of their Shampoo. The ad has a drawing of a blonde haired lady that is entitled "Professional Permanent Wave by Beautiful Hair Breck". This ad is larger than my scanner bed so the outer edges of the ad will not be visible in the scanned view. Full color 9 1/2" x 13" ad for "New Breck Concentrate Shampoo the only concentrate that lathers fast, rinses easily & leaves your hair Breck-manageable, too". There is a picture of a lady taking a shower and she has her eyes closed, the full container of Breck Shampoo in front of her face and her wet hair streaming over her face. The ad has eight numbers to it, each relates to something important. Number one says that it will give you Instant Lather in the palm of your hand. Number two says that you don't even have to work up a lather with Breck Concentrate. Number three says that rinsing is easy too. Number four says that there is an exclusive conditioning agent that makes your hair easier to manage. Number five claims that Breck gets beautiful results. Number six claims that the Breck helps to control dandruff. Number seven claims that it is made for smart shoppers. And number eight claims that it has formulas for everyone. Full color 10" x 14" ad for their Miss Clairol Hair Color Bath. The ad has a picture of a lady with red hair lying in the sand with a young boy who has dozed off to sleep. The ad headline asks the everpresent question "Does she...or doesn't she?" and the text makes the statement that this product gives "Hair color so natural only her hairdresser knows for sure!". The text talks about how easy it is to use and how amazing the results are. This ad is larger than my scanner bed so the outer edges of the ad will not be visible in the scanned view. Full color 9 1/2" x 13" ad for their Hair Color Bath. This ad has a photo of a young mother working with her young daughter on a sewing machine. The ad headline asks the familiar question "Does she...or doesn't she?". This ad is larger than my scanner bed so the outer edges of the ad will not be visible in the scanned view. Full color 9 1/2" x 13 1/2" ad has a photo of a smiling lady lying on her back on a blanket on the grass while she holds her baby face down next to her head. The ad headline asks the familiar question "Does she ... or doesn't she?" This ad is larger than my scanner bed so the outer edges of the ad will not be visible in the scanned view. Full color 9 1/2" x 13" ad for their Hair Color bath. The ad has a photo of a lady amongst some flowers with a young girl standing behind her looking questioningly at her hair. The headline hangs over their heads - "Does she...or doesn't she?". This ad is larger than my scanner bed so the outer edges of the ad will not be visible in the scanned view. Full color 9 1/2" x 13 1/2" ad for their Miss Clairol Creme Formula Hair Color Bath. The ad has a picture of this lady of which it is being questioned, "Does she...or doesn't she? ", while she is being kissed on the nose by her son who, by the dirt marks on his face and shirt, has to be involved in some kind of sports activity. The headline calls it "Hair color so natural only her hairdresser knows for sure!" and her son calls her "the peachiest mom a feller ever had!". The taxt talks about how natural it is and how it "takes only minutes" and urges you to try it yourself. Full color 10" x 14" ad for the Miss Clairol Hair Color Bath. This ad has a picture of a red-headed mother lying on a blanket placed on the grass and holding her young child who is face down while the mother is on her back. The mother has a very contented smile on her face and her eyes are closed as the headline asks the question "Does she...or doesn't she?" The ad claims that this is "Hair color so natural only her hairdresser knows for sure!". We are told that "Happy young mothers always look beautiful. But she has something special. A fresh shining quality, an endearing warmth and radiance. See how her hair sparkles with life! The color is rich, vibrant yet the effect is soft, ladylike and the hair itself silky, dellightful to touch". Full color 9 1/2" x 13" ad for their Creme Formula Hair Color Bath. The ad has a picture of a young mother who is giving her young child a bath. As she leans over the child they are both startled and turn to look behind them at something or someone who has just come into the room. The ad headline asks the age-old question, "Does she...or doesn't she?". This ad is larger than my scanner bed so the outer edges of the ad will not be visible in the scanned view. Full color 9 1/2" x 13" ad for their Creme Toner. This ad has a series of photos that show a lady with her hair done in nine different shades of blonde. The ad headline claims that you can "Now be any of these delicate blondes!" This ad is larger than my scanner bed so the outer edges of the ad will not be visible in the scanned view. Full color 10" x 13" ad that wonders, "Is it true...blondes have more fun?" Pictured in the ad are a dressed-up couple where the woman seems to be delighted as she puts on her white gloves. As the ad says, this lady is a blonde and she seems to be having quite a bit of fun. 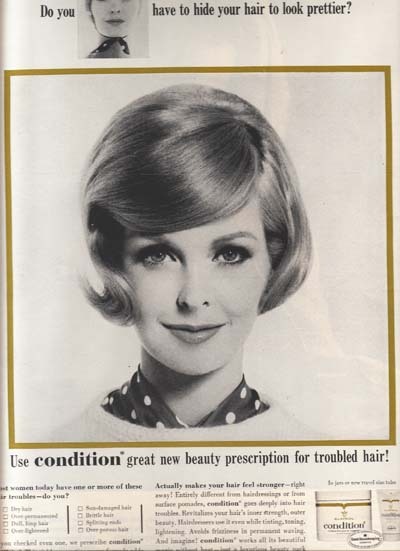 The ad says, "Just be a blonde and see - a Lady Clairol blonde with shining, silken hair. Doors open for blondes. Traffic stops for blondes. Men adore you, do more for you, life is tops for blondes! So switch to bewitch. With gentle, new Ultra-Blue Lady Clairol it's so easy. Takes only minutes. Feels deliciously cool going on, leaves hair in wonderful condition - soft, silkier to touch, altogether beautiful". Full color 10" x 13 1/2" ad for their Loving Care Hair Color Lotion. The ad has a picture of an attractive lady with dark hair standing in front of a rippling pool of water where her reflection, with gray hair, is visible. The ad has the familiar phrase "Hate that gray? Wash it away!" and says "New! Color only the gray without changing your natural hair color!". There is a smaller picture of a haggard looking man with a leer in his eyes and the caption that using Clairol "Makes your husband feel younger, too...just to look at you!". This ad is larger than my scanner bed so the outer edges of the ad will not be visible in the scanned view. Full color 10" x 13" ad for their Creme Hair Lightener. The ad has three pictures of ladies of the blonde persuasion running, resting and just generally enjoying the company of their handsome young men. The headline asks the question that was often posed, "Is it true...blondes have more fun?". The text begins by saying "Now's the time to find out!" and builds upon the belief that men find blondes more attractive and claims that their products are actually good for your hair. It talks about, and shows the boxes of, their Ultra-Blue Lady Clairol and the original Instant Whip Lady Clairol. Full color 9 1/2" x 12 1/2" ad for their Hair Color Bath. Using a perfect photo for the Autumn publication date of this issue, we see a lady playing with her children among the leaves that have turned color. The ad headline asks "Does she...or doesn't She". This ad is larger than my scanner bed so the outer edges of the ad will not be visible in the scanned view. Full color 9 1/2" x 13" ad for their Hair Color Bath. The ad has a picture of a young, blonde-haired mother holding her blonde son from behind as they stand under an umbrella on a rainy day. The ad headline asks the familiar question "Does she...or doesn't she?". This ad is larger than my scanner bed so the outer edges of the ad will not be visible in the scanned view. Full color 9 1/2" x 13" ad for their Champagne Blonde colors of Creme Toner. The ad has four pictures of a lady with different shades of blonde hair sipping from a glass of champagne. The ad identifies these shades as Champagne Parfait, Champagne Ice, Champagne Toast and Champagne Sherbet. The ad headline challenges you to "Be a Champagne Blonde...the champagne will follow!". This ad is larger than my scanner bed so the outer edges of the ad will not be visible in the scanned view. Full color 9 1/2" x 13" ad for their Lady Clairol Creme Hair Lightener. The ad has several pictures of a lady with blonde hair in and around a sports car rally with the man of her dreams. In each of these pictures she is laughing and seeming to enjoy herself and the ad headline asks the question "Is it true...blondes have more fun?". This ad is larger than my scanner bed so the outer edges of the ad will not be visible in the scanned view. Full color 9 1/2" x 13" ad for their Lady Clairol Creme Hair Lightener . There are several pictures of an attractive blonde being escorted around what looks like Washington D.C. by a young man in a business suit whose hair looks as though the part is burned in. The headline, next to the largest picture which shows her laughing as she has to pull away from a straw in some kind of a drink, asks the familiar question, "Is it true...blondes have more fun?". The text talks about the ease with which the Ultra-Blue Lady Clairol product works to lighten your hair and bring enjoyment to your life. Full color 9 1/2" x 12 1/2" ad for their Hair Color Bath. The ad has a photo of a mother lying cheek to cheek with her smiling young daughter. The ad headline asks the normal question "Does she...or doesn't she?". This ad is larger than my scanner bed so the outer edges of the ad will not be visible in the scanned view. Black and white 9 1/2" x 13" ad for their Shampoos. There is a picture tha shows World-Famous Hairdresser Gene Shacove using his hands to frame the face and hairdo of an attractive young lady as he struggles to squeeze his face into the picture too. The headline says "This world-famous hairdresser tells why...why you should use a special colorfast shampoo if you color or lighten your hair". The text contains some quotes attributed to Gene that help explain why this product is the best to use if you have changed the color of your hair. Full color 9 1/2" x 13" ad for their Creme Toner. This ad, similar to others on this page, has eight photos of different views of the same lady with different shades of blonde hair. Subtly different. The shades shown in this ad are Champagne Beige, Towhead, X-Lite A, Honey Chiffon, Ivory Chiffon, Champagne Sherbert, Pastel Pearl and White Beige. The ad headline claims that you can "Now be any one of 32 pale delicate shades of blonde". This ad is larger than my scanner bed so the outer edges of the ad will not be visible in the scanned view. Full color 9 1/2" x 13" ad for their Creme Toner. The ad has a series of photos of a lady with blonde hair whose hair is done in several of the "32 pale delicate shades of blonde" that are available from Clairol Creme Toner. The text mentions a few of the shades that are available and the picture identifies these and a few more. This ad is larger than my scanner bed so the outer edges of the ad will not be visible in the scanned view. Full color 9 1/2" x 13" ad for their Creme Toner has a series of photos of a lady with white sunglasses and her hair done in a variety of shades of blonde. These shades include Towhead, Champagne Ice, Ivory Chiffon, White Beige, X-Lite Platinum and Moonbeam. The text asks you "When there's a blonde on the beach, who looks at brown-hired girls?". The ad headline lets you know that "The Blondes of Summer are here!" This ad is larger than my scanner bed so the outer edges of the ad will not be visible in the scanned view. Full color 9 1/2" x 13" ad for their Born Blonde Lotion Toner. The ad has a very close photo of a lady with blonde hair who is winking left eye. The ad headline asks "born a blonde? No, Born Blonde". This ad is larger than my scanner bed so the outer edges of the ad will not be visible in the scanned view. Full color 10" x 13" ad for their Loving Care Hair Color Lotion. The ad photo shows a lady in front of a mirror with her reflection showing signs of gray hair while the human side of the mirror is blessed with pure brown hair. This ad is larger than my scanner bed so the outer edges of the ad will not be visible in the scanned view. Three color 9 1/2" x 12 1/2" ad for Clairol Condition. This ad has a photo of an attractive young lady with her hair in full view and a smaller photo of the same girl with her hair under a scarf. The ad headline asks the question "Do you have to hide your hair to look prettier?". This ad is larger than my scanner bed so the outer edges of the ad are not visible in the scanned view. Black and white 10" x 12 1/2" ad with a photo of a suave gentleman lifting a glass to the lady in his arms. The ad headline asks the question "Are you the same blonde he toasted last week?". This ad is larger than my scanner bed so the outer edges of the ad will not be visible in the scanned view. Full color 10" x 13" ad for Born Blonde with the statement that "Maybe the real you is a blonde". The picture shown in the ad is a very close-up of a lady with blonde hair and a dark blue eye. The hair is almost partially covering her eye of which only one of them is shown. The text in the ad describes how a woman will try to make herself look better and talks about the ways that she will try to make that happen. The ad says that many don't make the real decision: "they should have been born with blonde hair". They talk about the ease of the blonding process with this product since it "uses no peroxide after the lightening stage". They claim that your hair will stay shinier and healthier-looking with this product. Full color 9 1/2" x 13 1/2" ad for the Borne Blonde products, the Hair Lightening Kit and the Lotion Toner. 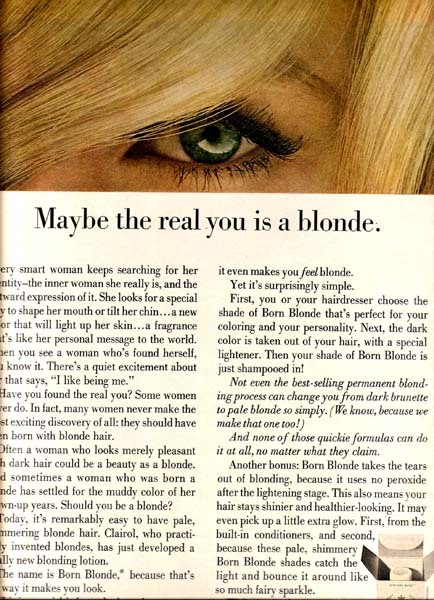 The ad contains a very large picture that looks into the seductive eyes of an attractive blonde with the words "Blonding simplified" witten across her forehead. This ad announces the new Complete Kit of this product and claims that it "Lifts out dark color faster than anything even Clairol has ever made". The text claims that now Blonding has become a two-step process, first using the Lightener to "Lift the dark color out" and then choosing one of the "12 pale, shimmery shades of Born Blonde" and shampoo it into your hair. Full color 9 1/2" x 13 1/2" ad for their Born Blonde Lotion Toner. The ad has a very close-up picture of a lady with blonde hair. The picture zooms in so that all that can be seen is her left green eye and some of the blonde hair that cascades over her eye. The ad headline states that "Maybe the real you is a blonde" and says that maybe instead of trying different styles with your make-up or rather than tilt your chin to get that different look you should try something different, try being blonde. The ad claims that all you have to do is use Born Blonde Lightener to lift the dark color out of your hair then shampoo in the Born Blonde Toner to complete the transformation. The ad wonders if this is really all that has to be done and answers by saying "Of course. Isn't this 1967?" Full color 9 1/2" x 13 1/2" ad for their Born Blonde Lotion Lightener. There is a picture of an attractive blonde looking coyly at the camera as she holds her folded-up glasses under her chin and the headline says "Blonding simplified". The text claims this product "speeds up blonding" and by being "created for today's blonde, it lightens faster, helps blondeness take better, whatever toner you use!". It mentions coming in a complete kit and simply tells the steps required to achieve blonding. Black and white 9 1/4" x 12" ad for the Kindness Instant Hairsetter. The ad shows a long-haired lady flipping her hair as she holds the case for the Instant Hairsetter in her hand. This ad is larger than my scanner bed so the outer edges of the ad will not be visible in the scanned view. Clairol Full color 10" x 13" ad for their Nice'n Easy Hair Coloring that you just shampoo in. The ad has a sequence of four photos showing a lady running closer and closer and finally into the arms of a dark suited gentleman. The ad headline promises that "The closer he gets...the better you look!" and the text contains simple directions on using this product. Clairol Full color 10" x 12 1/2" ad for their Instant Shampoo. 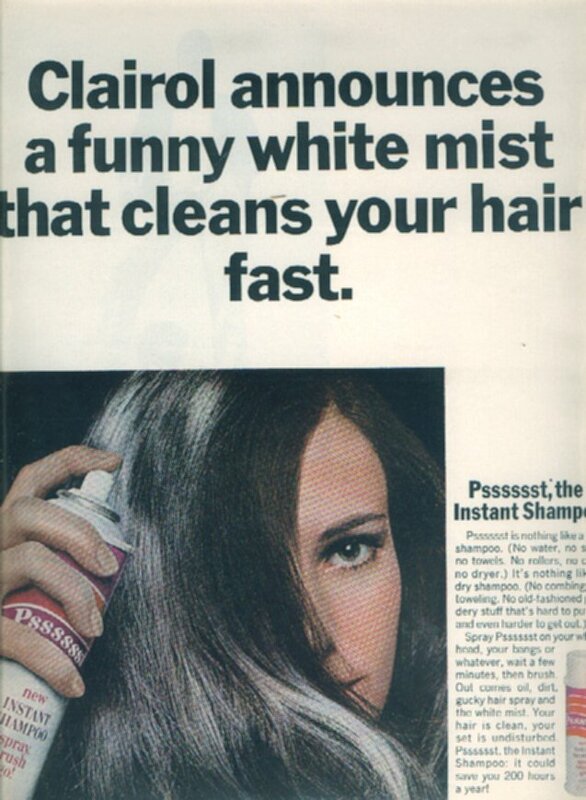 The ad headline says that "Clairol announces a funny white mist that cleans your hair fast." Three color 9 1/2" x 13" ad for this Hair Control for Men that was having a Sweepstakes giving away a 1964 Ford Mustang with a High Performance 289. There is a picture of a Red Mustang Convertible being driven by a smiling couple with the headline announcing "Free from Command. 70 Ford Mustangs". The text in the ad speaks very little about the product but almost entirely about the contest. This ad is larger than my scanner bed so the outer edges of the ad will not be visible in the scanned view. Full color 10" x 13" ad with three photos of the same lady with different hair styles from the time period. The ad headline claims that "No other Shampoo...only Drene with Hair Conditioning action leaves your hair so lustrous yet so easy to manage". Black and white 9 1/2" x 13" ad for their Shampoo that "silkens your hair...as it cleanses!". There is a picture of a confident young lady standing amongst flowers of all size and shapes and a yong man who looks at her with adoring eyes. The text assures you that "Yes, your hair can shine like silk, feel soft as silk, gleam and shimmer like silk. It's so easy to have excitingly lovely, lively hair...Just shampoo it with today's gentle Drene!". The ad then whispers that the sceret is the cleansing agent that is only in Drene which is responsible for silkening your hair. Full color 10" x 14" ad for their Shampoo. There is a soft picture of a seductive blonde flipping her hair under the headline that says "New! a shampo that SILKENS your hair!". The text talks about the lightening-quick lather and calls it "milder than castile" and says that it is "so mild you could use Drene every day!". The ad shows the bottle next to the box and assures you that "This is a New Drene". Full color 10" x 12" ad for their "color foam". 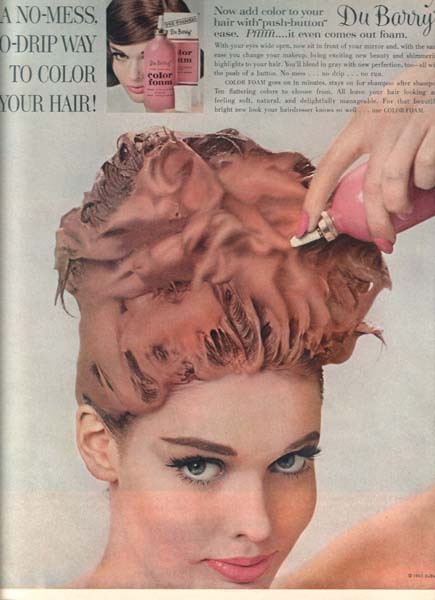 The ad shows a lady with her hair piled up with a red foam, and she looks happy. Full color 10" x 13" ad for this product to Remedy Gray Hair in Men. There is a picture of a man who has one side of his hair gray and the other black and the headline instructs you to "Put your hand over the gray half and see how much younger I look". The text describes how easy it is to use, how more men use it than you think and how it will not rub off onto your pillow at night. At the bottom of the ad is a picture that shows the box and the bottle of product. Full color 9 1/2" x 13 1/2" ad for the First Water-Astive Hairdressing for Men. The ad has a picture of a curvy lady in a mermaid suit sitting at the bottom of a waterfall and she is saying that "New Groom & Clean is water-active just like me". The text explains that as you comb it is cleaning your hair of dirt and dandruff. There is a picture in the bottom right corner that shows two male hands next to a sink with running water. One hand has a regular cream built up on it and the other, which is Groom & Clean, has no build-up. Black and white 4 3/4" x 13" ad for their popular Shampoo. The ad has a picture of a lady with a smart hairdo under the headline that warns you that "'Soaping' dulls hair - Halo glorifies it!". The ad text tries to explain that Halo contains no soap and no sticky oils yet cleans your hair using a "new patented ingredient". This ad is taller than my scanner bed so the outer edges of the ad will not be visible in the scanned view. Full color 9 1/4" x 12 1/2" ad has a photo of a blonde lady lying at the beach with her hair spread out on the towel behind her. The ad headline claims that "'Soaping' dulls hair - Halo glorifies it!". This ad is larger than my scanner bed so the outer edges of the ad will not be visible in the scanned view. Full color 7 3/4" x 11" ad for Halo Shampoo with Tommy Sands. The ad has the popular singer and actor standing in front of a microphone trying to sing a song but his attention seems to be drawn toward a pretty blonde who is standing by the front of the picture with her perfectly prepared hair stealing the show. The ad headline claims that "You can always tell a Halo girl. Her hair has that look-again look" and the text refers several times to the "shine" that Halo gives her hair yet in comparing hers and his they each seem to have just about as much shine and precision in placement. Three color 5" x 13" ad for their Shampoo Plus Egg. The ad has a picture of actress Wanda Hendrix who describes how and why using this product makes her hair better feeling and looking. The ad is announcing that if you buy an 89 cent large size you will get a second one free. This ad is taller than my scanner bed so the outer edges of the ad will not be visible in the scanned view. Full color 10" x 13" ad for their Professional Permanent. There is a colorful drawing of a lady in profile while the background shows her in romantic moments visiting popular places in Europe with the man of her dreams. The headline calls this "the most desired of all permanents" and the text tells you to ask your beautician about Revivex and Conditionol. It ends by urging you to "Make an appointment today for a Helene Curtis conditioning permanent!". Black and white 5" x 13" ad for their Shampoo plus egg. There is a picture of a formally dressed lady who is resting her chin in her gloved hands under a headline that says you can "condition even 'difficult' hair to Glorious natural radiance!". The text talks about the rich results you will receive from using this product and that the value of using egg on your hair is "Nature's own beauty blessing known to generations of glamor-wise women". The ad gives prices of 59 cents and $1.00 and mentions a Special Offer where, for the same price, a 2 or 4 oz Creme Rinse would be included. Black and white 5" x 13" ad for their Spray Net. There is a picture of a lady holding a can of this product next to her head with perfect curls and waves under the headline that is a statement from Helene Curtis saying that "I sincerely believe this is the greatest hair-beauty discovery since the permanent wave". The claims is made that it "keeps any hair-do softly in place all day long" and that it is "the perfect answer to wispy, straying hair". The prices are given as $1.25 for a regular size can and $2.00 for an economy size can. Black and white 5 1/4" x 14" ad for their Shampoo. The ad has pictures of six different ladies with six different hair styles and the headline claimes that "Powers Models thrill over amazing, beautifying action of this shampoo!" The text claims that "Even after the first shampoo - your hair sparkles for days with natural dazzling highlights" and talks about some of the other things it was developed for to help your hair be the best that it can. It also has a beneficial oil base that will keep your hair from becoming dry or brittle. Full color 7 3/4" x 10 3/4" ad that encouraged you to douse your hair with Listerine and massage it in if you wanted to really fight Dandruff. There is a picture of a woman with dark hair, probably attractive for her time, holding her hand to her hair and looking dreamily off to her right. The headline starts by saying that "It's an actual fact-" and the text goes into an explanation about how "dandruff and Listerine simply do not get along together". It explains that this treatment was discovered by the public who urged the makers of Listerine to make sure that everyone else knew of this miracle. It claims that the makers of Listerine have on file letters from ladies who are making claims "much stronger even than the manufacturers of Listerine would care to make". Full color 9 1/2" x 14" ad for their Tube or Jar of Shampoo. The ad has several photos of a lady who found a husband due to Lustre-Creme Shampoo. The ad headline says that a "Haunting melody inspires 'bachelor-girl' to become lively 'Lustre-Creme' Dream Girl". This ad is larger than my scanner bed so the outer edges of the ad will not be visible in the scanned view. Full color 9 1/4" x 12 1/4" ad for their Shampoo with a wonderful pictgure of Bette Davis. The ad has a photo of the actress from the shoulders up with her hair fluffed out. The headline claims that "The Most Beautiful Hair in the World is kept at its Loveliest with Lustre-Creme Shampoo". 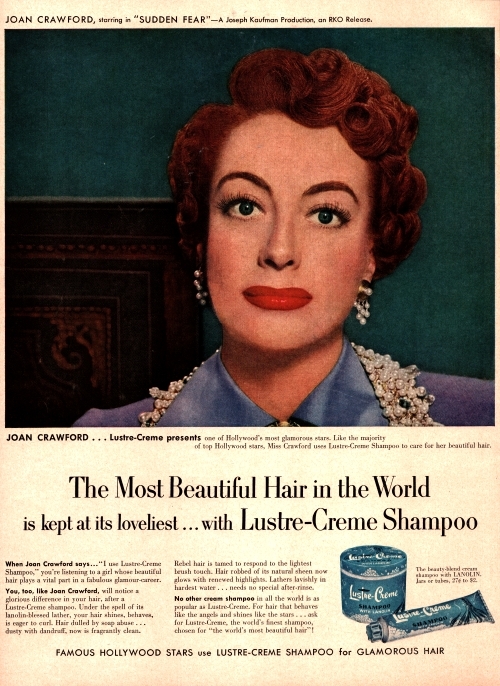 The text indicates that Ms. Davis has used Lustre-Creme Shampoo for some time and she has been named by Modern Screen magazine as being "one of the 12 women having the most beauriful hair in the world". Full color 9 1/2" x 12" ad for their Shampoo. The ad features a photo of actress Rhonda Fleming taken against a haystack. The ad headline claims that "The Most Beautiful Hair in the World is kept at it's loveliest...with Lustre-Cream Shampoo." This ad is larger than my scanner bed so the outer edges of the ad will not be visible in the scanned view. Full color 5" x 13" ad with Rhonda Fleming. This is a smaller version of another ad on this page. The ad has a picture of this stunning redhead in a polka-dot top with a background of hay. The ad mentions her new movie Crosswinds and the headline promises that "The Most Beautiful Hair in the World is kept at its loveliest...with Lustre-Creme Shampoo". This ad is taller than my scanner bed so the outer edges of the ad will not be visible in the scanned view. Full color 9 1/2" x 13" ad with actress Loretta Young. The ad has a photo of the attractive red-head with the headline "The Most Beautiful Hair in the World is kept at it's loveliest...with Lustre-Creme Shampoo". This ad is larger than my scanner bed so the outer edges of the ad will not be visible in the scanned view. Full color 10" x 13" ad with actress Joan Crawford. The ad features a photo of a grim-faced Miss Crawford and mentions her movie "Sudden Fear". This ad is larger than my scanner bed so the outer edges of the ad will not be visible in the scanned view. Full color 9 1/2" x 13 1/2" ad for their Shampoo Products with popular actress Betty Hutton. There is a picture of her attractively made-up and the caption says that she, like the majority of Hollywood stars, uses Lustre-Creme. The headline claims that "The Most Beautiful Hair in the World is kept at its loveliest...with Lustre-Creme Shampoo" and the picture shows that it is available in either a jar or a tube. The test claims that you will notice a difference when you use it and mentions other benefits from its use. Full color 4 3/4" x 10 3/4" ad for their shampoo with Rita Hayworth. The ad has a picture of this attractive lady with her red-hair perfectly prepared smiling at the camera as the caption mentions her new movie Affair in Trinidad. The headline, which could be referring to Rita, claims "The Most Beautiful Hair in the World is kept at its loveliest...with Lustre-Creme Shampoo". The text has her claiming that she uses this product and that you, like Rita did, will "notice a glorious difference in your hair after a Lustre-Creme Shampoo". It claims that this is the most popular cream shampoo in the world and that it is available in jars or tubes peiced from 27 cents to $2. Full color 9 1/2" x 13" ad for their Shampoo with Lanolin with actress Pier Angeli. There is a large picture of the actress with her hair done nicely and with her green eyes staring into the camera as the caption mentions her movie The Story Of Three Loves. There are three smaller pictures that show her combing and styling her hair with the captions saying "Glamour-made-easy! ", "Will not dry hair!" and that it "Makes hair eager to curl!". The ad makes the normal claim that "4 out of 5 Top Hollywood Stars use Lustre-Creme Shampoo" and mentions prices ranging from 27 cents to $2 in jars or tubes. Full color 9 1/2" x 13 1/2" ad for their shampoo with actress Esther Williams. The ad has a picture of the actress dressed for a formal evening with a white mink tossed over her shoulder and the caption mentions her movie, Dangerous When Wet. The ad claims that Esther is one of the majority of top Hollywood stars that are now using Lustre-Creme, in fact, they claim that "For the Most Beautiful Hair in the World, 4 out of 5 top Hollywood Stars use Lustre-Creme Shampoo". There are three smaller pictures of this actress working on her hair with the captions providing tips and claims about it's effectiveness. One of the containers is shown in the ad and mention is made of the prices ranging from 27 cents to $2. It also mentions their new Lotion Foam, available from 30 cents to $1.00. Full color 7 3/4" x 10 3/4" ad with Marilyn Monroe for their Lustre-Creme Shampoo which is now also in New Lotion Form. There is a picture of this incredibly-popular actress holding up a bottle of this product in the Lotion form and the caption has her admitting "Yes, I use Lustre-Creme Shampoo". The caption mentions her new movie, Gentlemen Prefer Blondes and the ad talks about 4 out of 5 top Hollywood stars using this product and gives tips on how to use either the Creme or the Lotion form. Full color 7 1/4" x 10 1/2" ad for their Shampoo with actress Ava Gardner. The ad mentions her new movie Mogambo ahd has her staring up into the camera. The headline assures the readers that "For the Most Beautiful Hair in the World 4 out of 5 Top Hollywood Stars use Lustre-Creme Shampoo" and has a picture of a blonde washing her hair with one hand and having to use two hands to contend with the body her hair now has. Full color 9 1/2" x 12" ad with actress Rita Hayworth. This ad, for their Shampoo, has a headline that claims that "For the Most Beautiful Hair in the World 4 out of 5 Top Hollywood Stars use Lustre-Creme Shampoo." This ad is larger than my scanner bed so the outer edges of the ad will not be visible in the scanned view. Full color 8" x 10 3/4" ad with actress Debra Paget for their Shampoo. There is a picture of the actress smiling into the camera under the headline "Never Dries - it Beautifies!". The ad mentions that the Shampoo is aailable in either Cream or Lotion and calls it "Hollywood's favorite". Full color 9 1/2" x 13" ad for their Shampoo with actress Virginia Mayo. The ad has a photo of the actress and mentions her new movie King Richard and the Crusaders. The ad headline claims that it "Never Dries - it Beautifies!". This ad is larger than my scanner bed so the outer edges of the ad will not be visible in the scanned view. Full color 9 1/2" x 13" ad with actress Maureen O'Hara. The ad contains a nice photo of the red head wearing a pink dress and the ad headline claims the the shampoo "Never Dries - it Beautifies!". This ad is larger than my scanner bed so the outer edges of the ad will not be visible in the scanned view. Full color 10" x 14" ad for their Shampoo in Cream or Lotion. The ad has a picture of smiling actress Ann Blyth staring into the camera as her attractive red-hair draws attention from the readers. The headline, describing how this shampoo works, says that it "Never dries - it Beautifies!" while under the picture of the actress is mention of her new movie The King's Thief. This ad is larger than my scanner bed so the outer edges of the ad will not be visible in the scanned view. Full color 10" x 13" ad for their Shampoo with a photograph of actress Debbie Reynolds. The ad mentions her new movie The Tender Trap and the headline claims this shampoo "Never Dries - it Beautifies!" This ad is larger than my scanner bed so the outer edges of the ad will not be visible in the scanned view. Full color 6 1/2" x 9 3/4" ad with actress Jeanne Crain for their Shampoo. 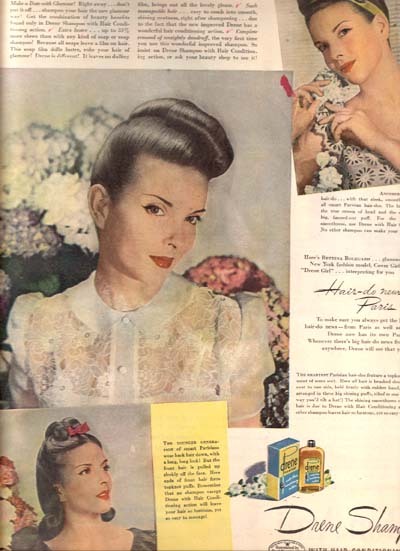 The ad has a photo of the actress wearing a white dress and mentions her new movie The Joker is Wild and claims that "Jeanne Crain loves Lustre-Creme Shampoo". Full color 7 3/4" x 10 3/4" ad for their Liquid Shampoo with Cyd Charisse. There is a picture of her placing her hand on her freshly-washed hair and the caption mentions her new movie Party Girl. The headline claims that "Now you can shampoo...Set with plain water...and have lively, natural looking curls!" and that it is Rich and Lanolin-Blessed. The text gives directions "For Curls That Come Easy" and has a picture that shows the three different ways that it is available on your store shelf. The ad assures you that Never Dries - It Beautifies!<?b>. Full color 9 1/2" x 13" ad for their Shampoos. The ad has a picture of a pretty blonde dressed in a pink gown and holding a pink boa while she sits on a hammock of fish net surrounded by different shades of pink. The ad headline reminds us that "Pink is for Girls" and the ad tells us that "...only Lustre Creme is pink". The ad shows a jar of Lustre Creme Shampoo, a container of their Lotion Shampoo and a tube of the New Pink Shampoo while easing our concerns by telling us that "Lustre Creme is safe for color-treated hair too". This ad is larger than my scanner bed so the outer edges of the ad will not be visible in the scanned view. Three color 8" x 11" ad for their Hair Spray being used by actress Ginger Rogers. The ad has a picture of her looking back to the camera as she sprays her hair with this product. The headline touts "Hollywood Discovery! A non-drying spray-set with no Lacquer at all! Sets hair to stay - the softest way!". The ad mentions Ginger's new movie, The First Traveling Saleslady and brags that "There are 2 Lustre-Nets". 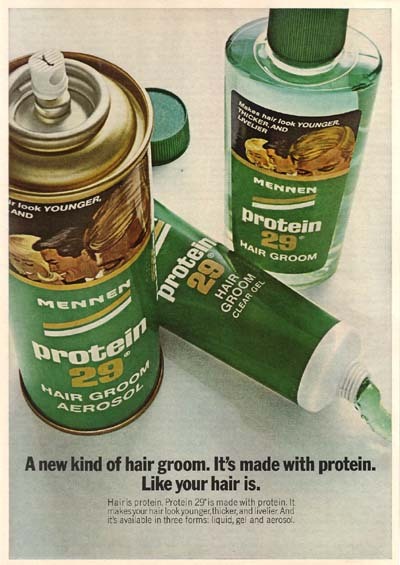 Full color 7 1/4" x 10 1/4" ad that shows their three types of Protein 29 hair care products for men. Full color 10" x 13" ad with a drawing of a mother washing the hair of one of her daughters while the other one watches. The product is from the R.L. Watkins Company and looks to be from the 1920's. 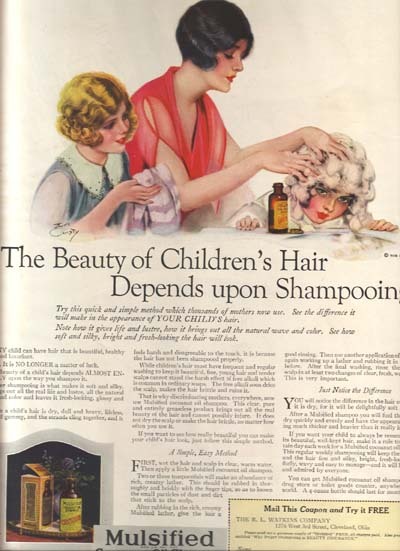 The ad headline informs us that "The Beauty of Children's Hair Depends upon Shampooing". Full color 8 3/4" x 12" ad written in German taken from a German magazine. The ad features a closeup photo of a blonde pulling her hair back from her eyes as well as a smaller photo of four different containers of their product. Full color 9 1/2" x 13 1/2" ad for their Shampoo. The picture in the ad shows a romantic moment where a woman whose red hair is styled back and is wearing a pink formal dress with a string of pearls around her neck is about to be kissed by a handsome man in a black tuxedo. The headline says that "Procter & Gamble Presents Prell - The New Radiant-Creme Shampoo in a Tube". The ad continues by claiming that "Prell remoces Dandruff in as little as 3 minutes!" and that it "Leaves Hair Radiantly Clean Radiantly Smooth". The text offers opinions about Prell from Dad, Mother, Brother, Sister, Auntie and from All, The text offers further claims about the control of Dandruff and about how much your hair will shine when you use it. Full color 7 1/4" x 10 1/2" ad for their Shampoo. The ad has several pictures of an attractive blonde swinging and smiling on a rope swing. The ad headlines ask you to "Join the swing to Prell Shampoo" and tells you that "Prell leaves hair Radiantly Alive...soft, smooth, younger looking!". Full color 9 1/2" x 13 1/2" ad for their Extra Rich Liquid Shampoo. We see a picture of a lady who has decided to shampoo her hair then attach jewelry before rinsing. The caption urges you to "Drench your hair in luxury with Liquid Prell" and credits the "Lather hairdo shaped by Enrico Caruso". Full color 7 3/4" x 10 3/4" ad for their Home Permanent. There is a picture of an attractive blonde holding some yellow flowers to her smiling face as the ad talks about this product from Richard Hudnut. The text claims that this is the only permanent you cn wash instantly so it lives up to its name, Quick. Full color 9 1/2" x 13" ad for a unique way for men to comb and control their hair. The ad has a picture of a unit with a comb attached to a container that holds the hair dressing. The ad headline calls it "Radar radically new liquid hairdressing for men" and claims that it "controls your hair but doesn't show". This ad is larger than my scanner bed so the outer edges of the ad will not be visible in the scanned view. Black and white 9 1/2" x 13" ad for their Short-Cut Curlers with actress Mary Martin. The ad has a photo of her using this product and a photo of her brushing her hair out after removing the curlers. The ad headline has her claiming "I've found a new kind of curler that really holds...and curls...even tiny wisps!". This ad is larger than my scanner bed so the outer edges of the ad will not be visible in the scanned view. Black and white 9 1/2" x 12" ad for their Creme Shampoo has a photo of actress Marilyn Monroe brushing her hair. The ad headline has her saying "Such a wonderful shampoo! It leaves my hair so shining soft, so easy to curl!". This ad is larger than my scanner bed so the outer edges of the ad will not be visible in the scanned view. Full color 7 3/4" x 10 1/2" ad for their Mist-Air Hot Comb. The ad has two pictures of actor Edd Byrnes, famous for being the guy who was always combing his hair in the TV show 77 Sunset Strip. The first photo is from that time period and the second photo is him, now using the Mist-Air Hot Comb. The ad headline introduces the ad information by saying "A few words about combing your hair by the man who bacame famous for it". Full color 9 1/2" x 12 1/2" ad for their Color Up cream tinting rinse. The ad has a photo of two attractive ladies standing together. The ad headline claims that "It's never been so easy...so safe...so satisfying for young mothers to camouflage grey...for young grandmothers to show it off...". This ad is larger than my scanner bed so the outer edges of the ad will not be visible in the scanned view. Full color 9 1/2" x 11 1/2" ad for their Outrageous Shampoo. There is a picture of a lady with stunning hair lying on her side wearing a white sleeveless gown and the headline has her saying "I say your hair can be Outrageous". The picture also shows bottles of their Shampoo and their Conditioner while the text mentions the pro-vitamin B5, silk protein and moisture-binding silicone ingredients that are contained in these products. Black and white 7 3/4" x 10 3/4" ad for their Quick Home Permanent. There are two smaller photos of a woman doing the wave, the first is the weary old wave and the second is the new Quick wave and the headline claims that "Now! Richard Hudnut frees women from 1/2 their waving work!". Below these two pictures is a larger picture of a this woman after using the Quick way, all dressed up for a glamorous night out and the caption urges you to "Note the soft natural look of the new Quick wafe - how beautifully it suits the newest styles". The text describes the many benefits that you will enjoy from using this product and gives a price of $2.00 per box with each box giving you two waves. Full color 9 1/2" x 13" ad for their Color Shampoo. The ad has a picture of a stunning lady with red hair sitting with her eyes closed and her mouth open. The ad headline assures you that "You can have Lasting, Natural looking haircolor with Roux Color Shampoo. No other haircoloring gives such Beautiful results the Easy "Shampoo-Way" - in Quick "Shampoo-Time". The ad shows the three steps necessary to use this product and mentions the "12 Heavenly Colors" that were available. This ad is larger than my scanner bed so the outer edges of the ad will not be visible in the scanned view. Black and white 10" x 14" ad for their Cream Shampoo. The ad has pictures of four women with different hair colors whose hair is brighter and healthier because of using Shasta. The ad headline claims that Shasta "Sparks your hair with brighter, richer color" and mentions that you can get a Big Economy Jar with Four Full Ounces for 89 cents. This ad is larger than my scanner bed so the outer edges of the ad will not be visible in the scanned view. Full color 9 1/2" x 13" ad for their Silver-Tone color conditioner. The ad has a photo of an attractive, well-dressed lady with gray hair leaving her seat at the opera or something similiar. Several men in the audience are watching her as she moves away. 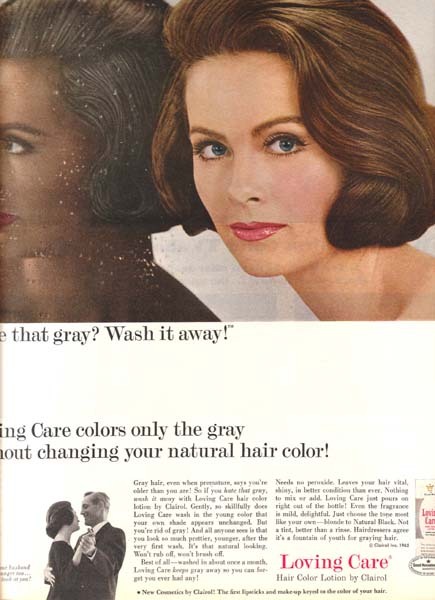 The ad headline asks "Are you just a whisper away from the full beauty of gray?" This ad is larger than my scanner bed so the outer edges of the ad will not be visible in the scanned view. 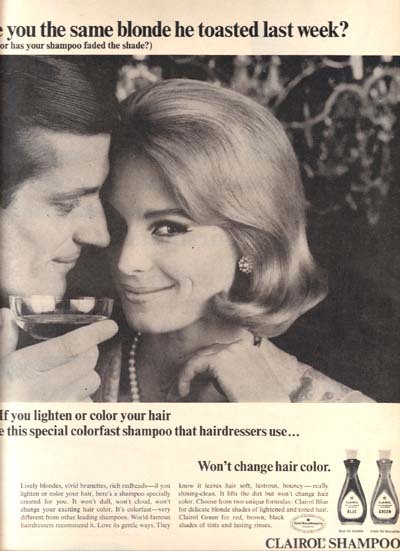 Full color 9 1/2" x 13" ad for their Color-Tone color conditioner. The ad has a photo of the back of a lady's head as she shows off her attractive red hair, a gold pocket watch and her box of Technique Color-Tone. The ad headline asks "Afraid of dyes? Fed up with rinses? You need Technique - the color conditioner!" This ad is larger than my scanner bed so the outer edges of the ad will not be visible in the scanned view. Three color 9 1/2" x 14" ad for their Medicated Hair Dressing. The ad has a picture of a man with a startled look on his face who has just quickly turned his head without moving a hair on his head. Looking at the other items around him I would have to hazard a guess that this man is a "rocket scientist". The caption claims that "Your hair is 'under fire' all summer...protect it now!" and claims that it "Keeps your hair in place around-the-clock. Moisturizes your scalp to stop dryness...fight dandruff!" Black and white 4 3/4" x 13" ad for their Hair Tonic. The ad has a series of two pictures that tell a story; not a pretty story, just the one they want you to hear. The top picture shows a young man who has been playing tennis with a young lady. His hair is flying wildly and the lady is looking very concerned and thinking "oh-oh, Dry Scalp!". In the next picture this same young man is standing in front of the bathroom mirror with his bottle of Vaseline Hair Tonic and slicked-down hair and he mentally checks-off "Hair looks better...scalp feels better...when you check Dry Scalp". Black and white 9 1/2" x 12 1/2" ad for their Hair Tonic for Men. The top picture in the series is a close-up of a woman's eyes looking toward the headline which asks the question "What kind of man uses Vaseline Hair Tonic". The next pictures in this series show a man driving his Alfa Romero with the top down on a curvy road in the Pyrenees where a woman whose car is out of control goes flying past. She screams "No brakes!" which causes him to spring into action. He downshifts and pulls ahead of her, cutting in front so that he can slow down and bring her car to a safe stop. He gets out and stands by her car basking in her adoration as she looks at his head, every car still in place. This ad is larger than my scanner bed so the outer edges of the ad will not be visible in the scanned view. Black and white 9 1/2" x 13" ad that lets us in on just what kind of a man really uses Vaseline Hair Tonic. At the top of the page is a close-up of the lady with wondering eyes and then the story is told in pictures. A man in a tux is dropping his date off at her apartment and waves good-bye as she walks toward the door. Behind him several motorcyclists come up and stop for some harassment. They circle him on their bikes and start to get off when one pulls out a lead pipe and starts to raise it over his head. Our hero uses a crescent kick to seperate the man from his pipe which goes flying up in the air only to be retreived by the man in the tux. He taps the offender on the forehead and stands firmly in control as the attractive blonde, who rode up on the back of the leader's bike, comes forward with a look of desire on her face. "The man who knows how to take care of himself uses Vaseline Hair Tonic" is the claim made by the manufacturer but I am not sure if Karate lessons come with your purchase. Full color 9 1/2" x 12" ad for their Hair Tonic for Men. The top of the ad has a close-up picture of a lady's eyes with the caption "What kind of man uses Vaseline Hair Tonic?". There are a series of photos that tell a story of a man, who uses Vaseline Hair Tonic, watching a lady losing at a Blackjack table. He realizes that the dealer is using a highly polished ring to allow himself to see the cards and deal the card that will keep the lady losing. Our hero grabs the hand of the dealer, forcing him to deal the card from the top of the deck that gives the attractive and suddenly thankful lady a hand of 21. The end of the ad tells us that "The man who knows how to take care of himself uses Vaseline Hair Tonic". This ad is larger than my scanner bed so the outer edges of the ad will not be visible in the scanned view. Black and white 5 3/4" x 12 1/2" ad for their Hair Tonic for Men. There is a picture of a man with perfectly combed hair reading a newspaper and the headline encourages you to "Try Vitalis and the 60-second workout". The pictures show and the text explains that you need to rub your hair and scalp for 50-seconds with Vitalis before combing for 10-seconds. This workout, if done twice a week, will take care of dandruff and make your hair look better. Full color 9 1/2" x 13" ad for this hair dressing for men. The ad has a picture of a man with a full head of hair that is perfectly in place working on his sailboat while several attractive ladies stand behind him, whispering as they check him out. The ad headline asks you to "Summerproof your Hair with Vitalis" and the ad text describes the 60 second workout which involves massaging Vitalis into your scalp. The ad mentions that Vitalis contains pure vegetable oils which, since my wife is always watching The Food Network, brings to mind all kinds of emergency cooking scenerios. This ad is larger than my scanner bed so the outer edges of the ad will not be visible in the scanned view. Black and white 9 1/2" x 13" ad for the "New greaseless way to keep your hair neat all day" which happened to be Vitalis Hair Tonic with V-7. There are two pictures at the top of the page and they are both of a man called Billy Pierce. In the first picture he is taking a shower and, well, the headline says that "Billy Pierce took a shower" and he is drenched with his mouth open. In the second picture he is smiling and his hair is combed very neatly and the ad headline says "then he used Vitalis". This Billy Pierce is a left-handed pitcher for the Chicago White Sox and he says "I take a shower every day - so I use Vitalis every day". He then says that "It's not greasy. And if the rest of me stays in as good condition as my hair and scalp, I'll still be playing ball in 1970". Black and white 9 1/2" x 14" ad for their Hair Tonic with V-7. The ad has two pictures of Chicago White Sox pitcher Billy Pierce, the first is of him in the shower with water running down his face and his hair looking like it does when you are in the shower. In the second picture he is out, dressed and has combed his hair perfectly with Vitalis. The headline calls this the "New greaseless way to keep your hair neat all day" and has pictures of a lady holding up pillows, one from a man who uses a greasy hair tonic and the other from a man who uses Vitalis. As should be expected from an advertisement the one on the left, the greasy hair tonic, looks like it was placed under a battered 1910 Ford truck to keep the driveway clean. This ad is larger than my scanner bed so the outer edges of the ad will not be visible in the scanned view. Black and white 9 1/2" x 13" ad for their Cocoanut Oil Castile Shampoo. The ad says "New! Introductory 1/2 Price Sale. $1.00 size now only 50 cents". This ad is larger than my scanner bed so the outer edges of the ad will not be visible in the scanned view. Black and white 7 1/2" x 11" for their Long-Lasting Shampoo. There is an actual photo of Mollie Ann Bourn who has had the blonde hair on the right side of her head washed with Woodbury Shampoo and the left side washed with "another popular shampoo". The difference is enough for a guy like me to notice but pay little attention to and the headline claims that "A famous laboratory proves: Hair washed with the new Woodbury Shampoo holds curl better, keeps set longer". The text claims that hundreds of women were tested this way with Good Housekeeping magazine overseeing and claims that a "generous bottle" would only cost you 39 cents.